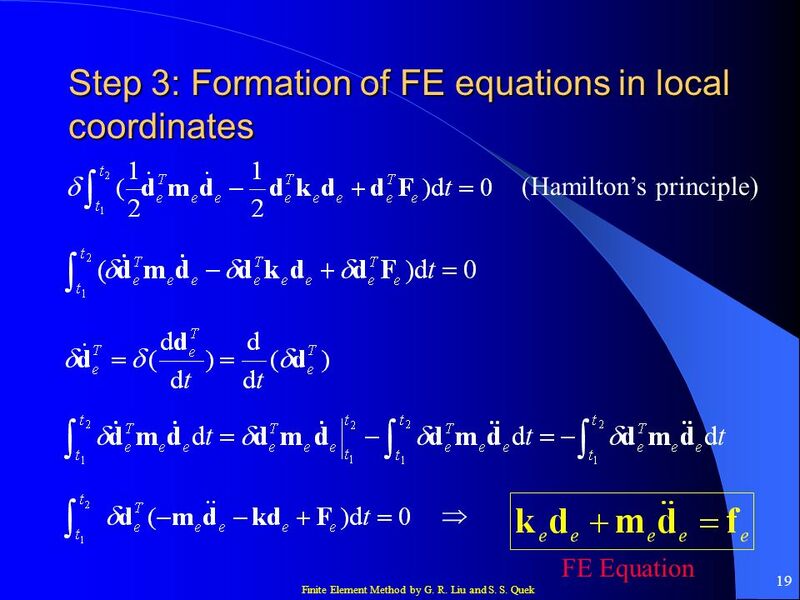 System equations: strong form, difficult to solve. 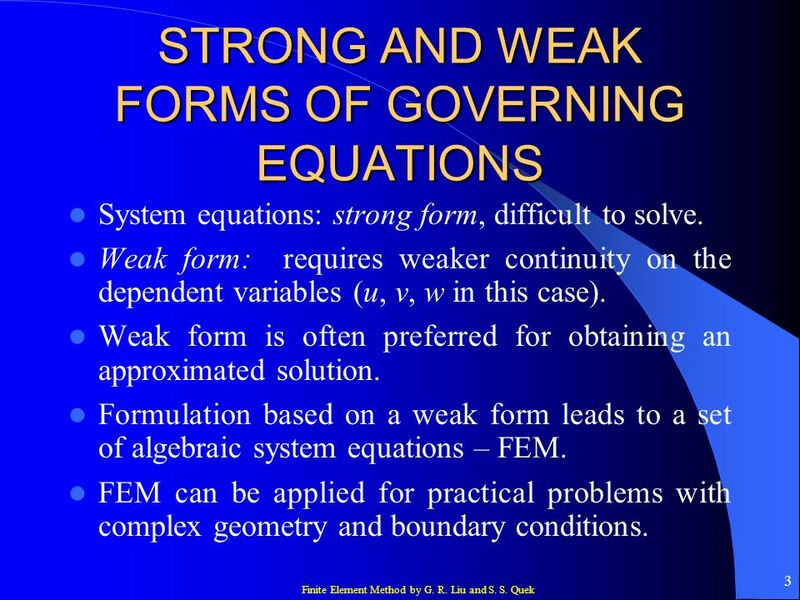 Weak form: requires weaker continuity on the dependent variables (u, v, w in this case). Weak form is often preferred for obtaining an approximated solution. Formulation based on a weak form leads to a set of algebraic system equations – FEM. FEM can be applied for practical problems with complex geometry and boundary conditions. 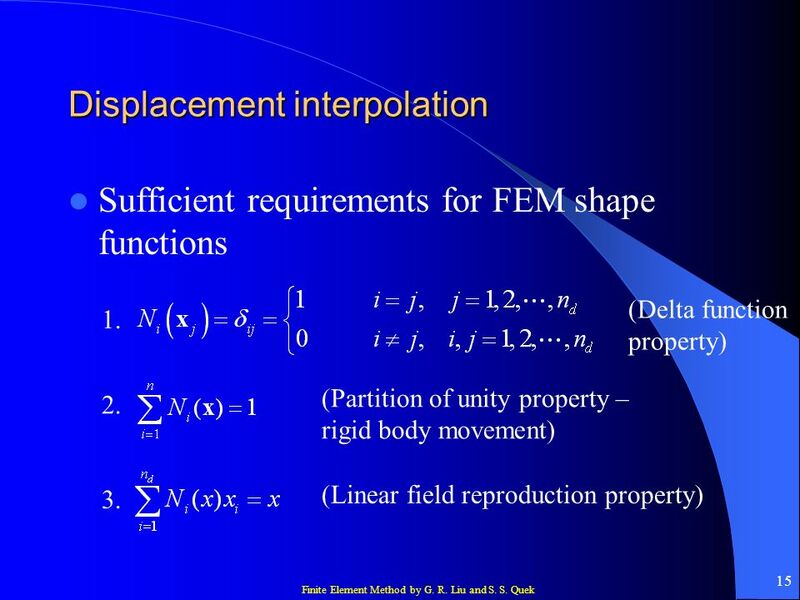 The solid body is divided into Ne elements with proper connectivity – compatibility. 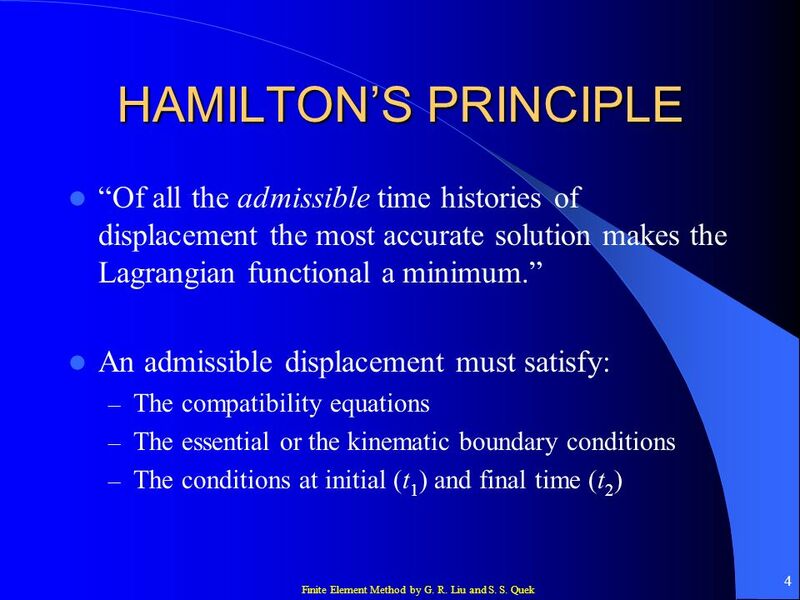 All the elements form the entire domain of the problem without any overlapping – compatibility. There can be different types of element with different number of nodes. 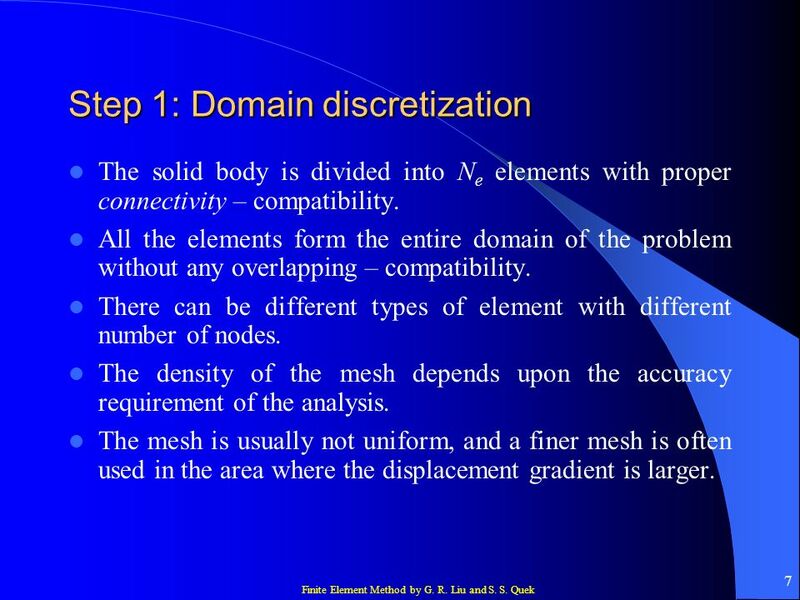 The density of the mesh depends upon the accuracy requirement of the analysis. 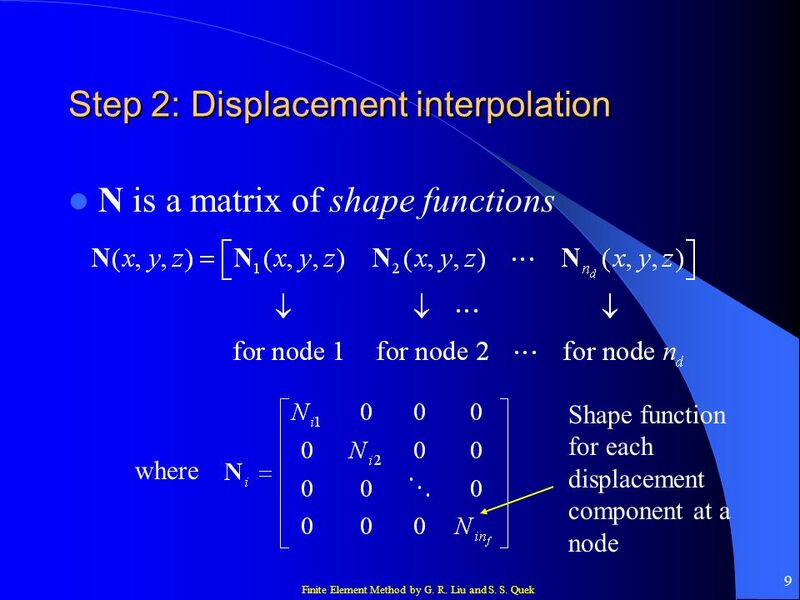 The mesh is usually not uniform, and a finer mesh is often used in the area where the displacement gradient is larger. 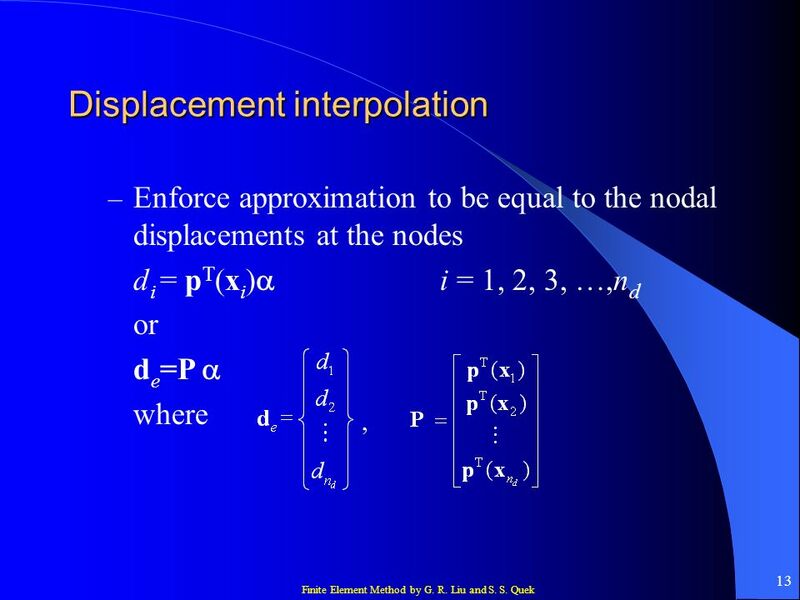 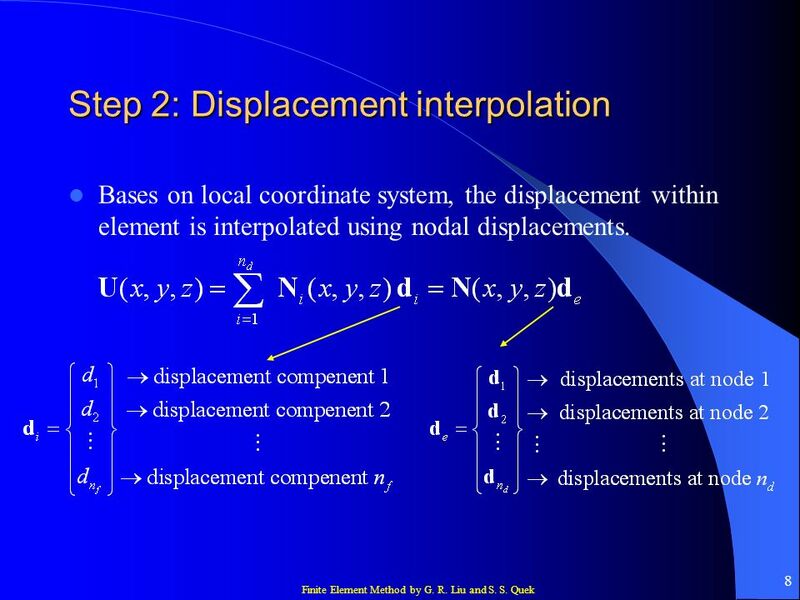 Bases on local coordinate system, the displacement within element is interpolated using nodal displacements. 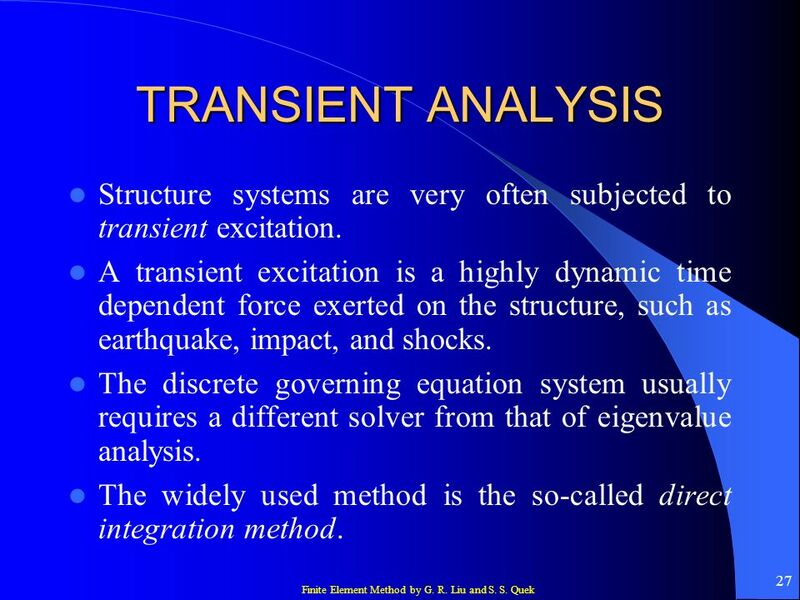 27 TRANSIENT ANALYSIS Structure systems are very often subjected to transient excitation. 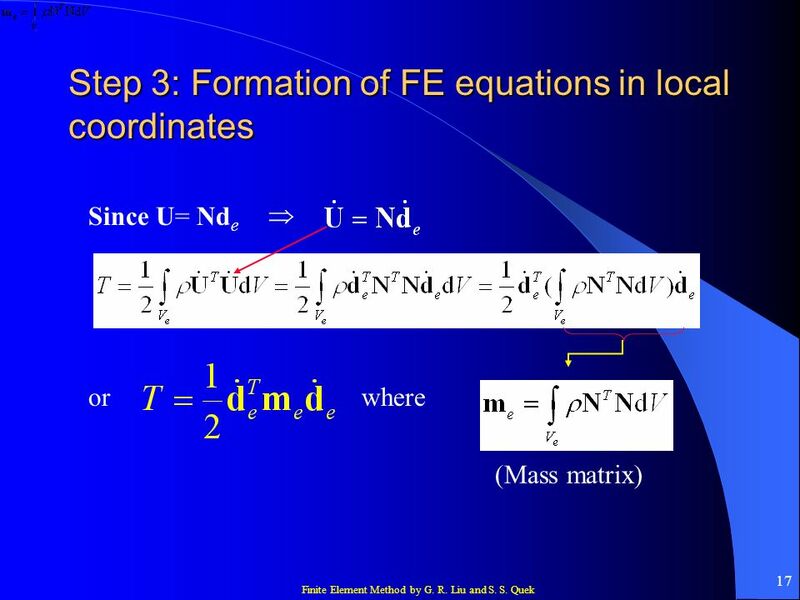 A transient excitation is a highly dynamic time dependent force exerted on the structure, such as earthquake, impact, and shocks. 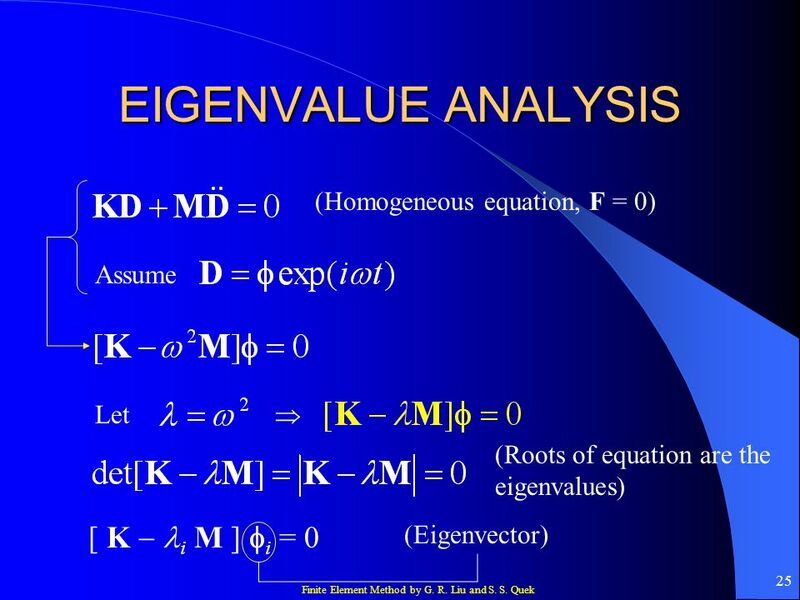 The discrete governing equation system usually requires a different solver from that of eigenvalue analysis. 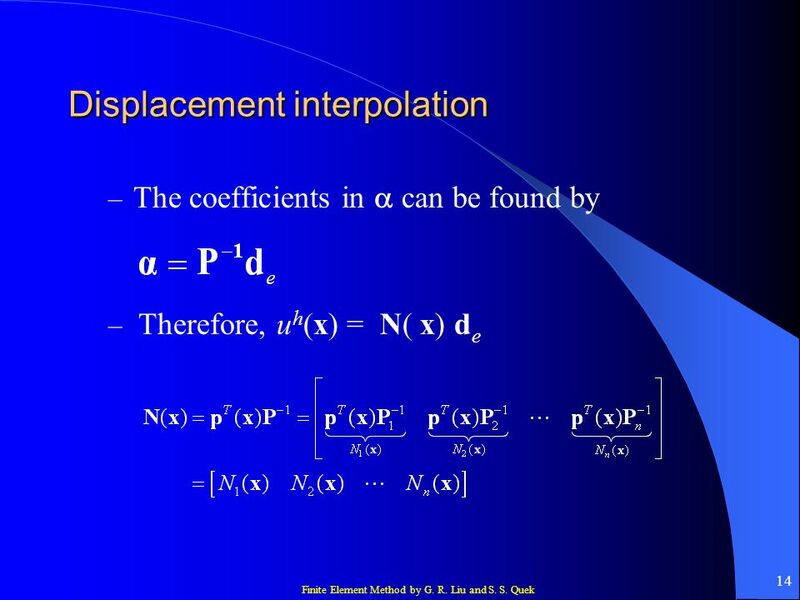 The widely used method is the so-called direct integration method. 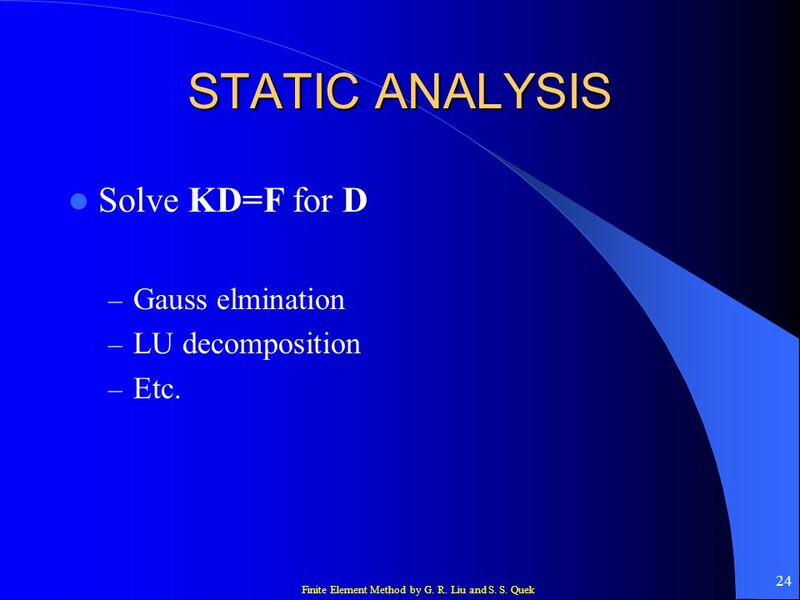 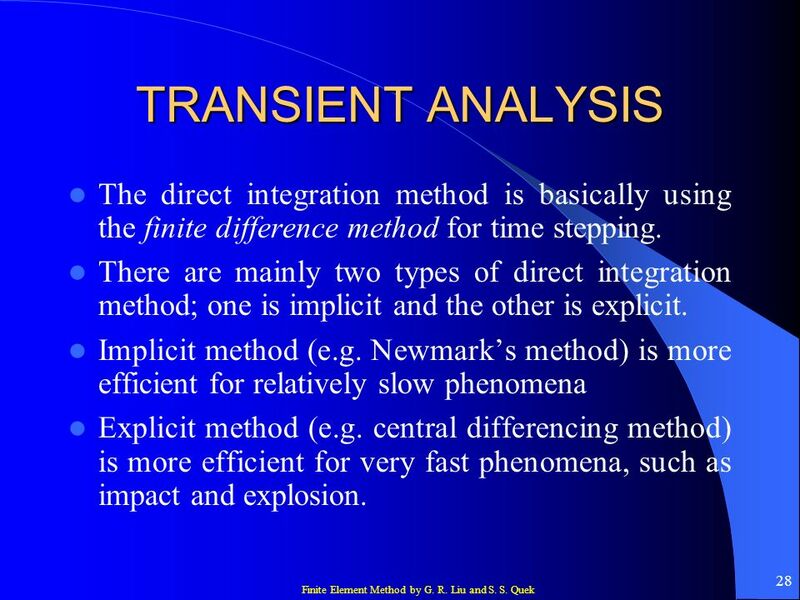 28 TRANSIENT ANALYSIS The direct integration method is basically using the finite difference method for time stepping. 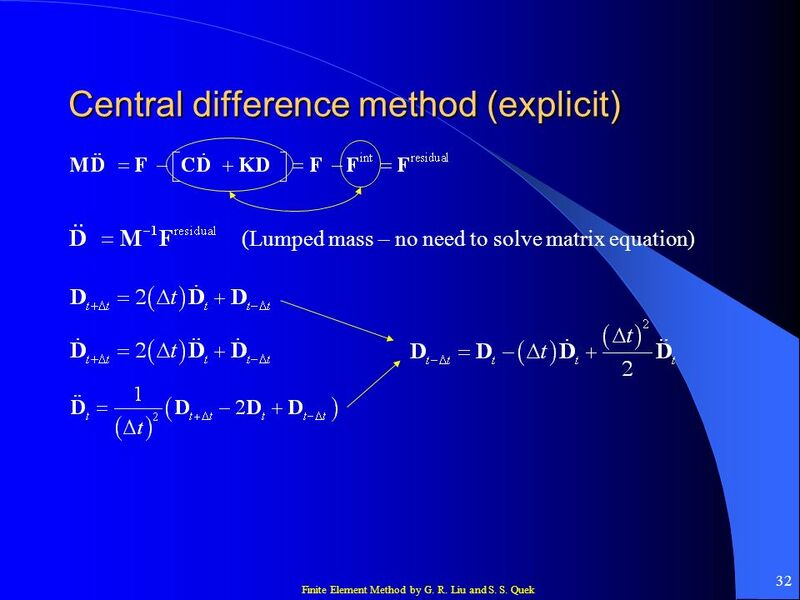 There are mainly two types of direct integration method; one is implicit and the other is explicit. Implicit method (e.g. 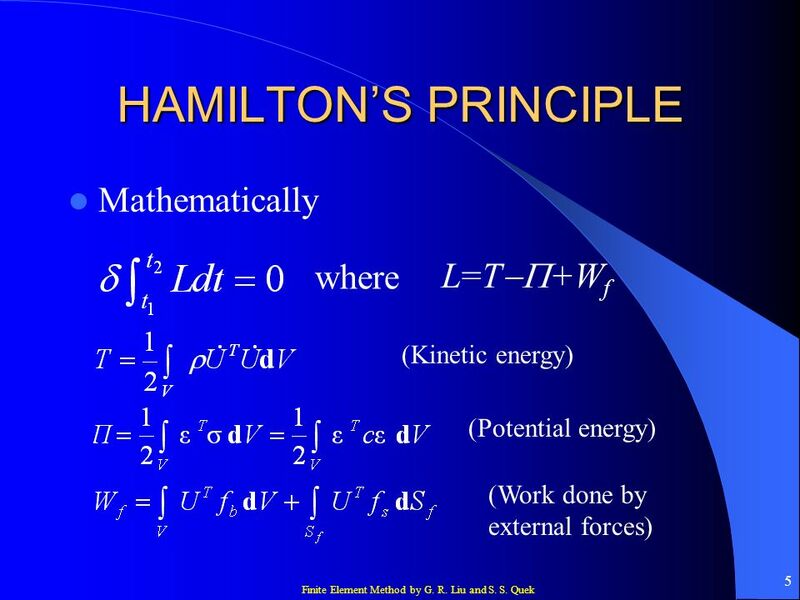 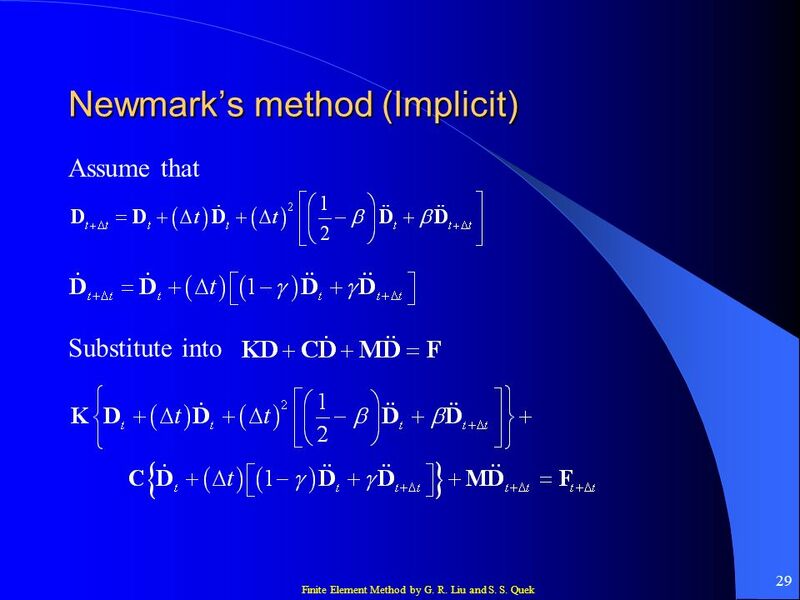 Newmark’s method) is more efficient for relatively slow phenomena Explicit method (e.g. 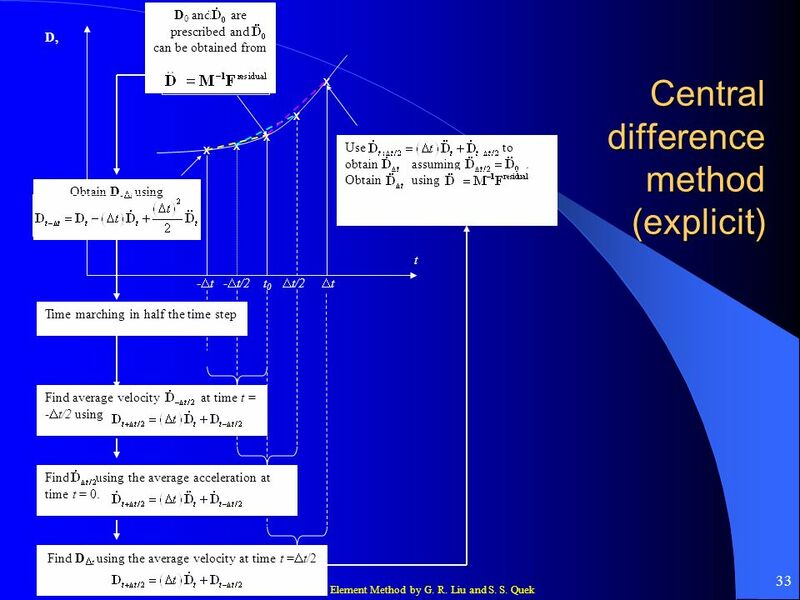 central differencing method) is more efficient for very fast phenomena, such as impact and explosion. 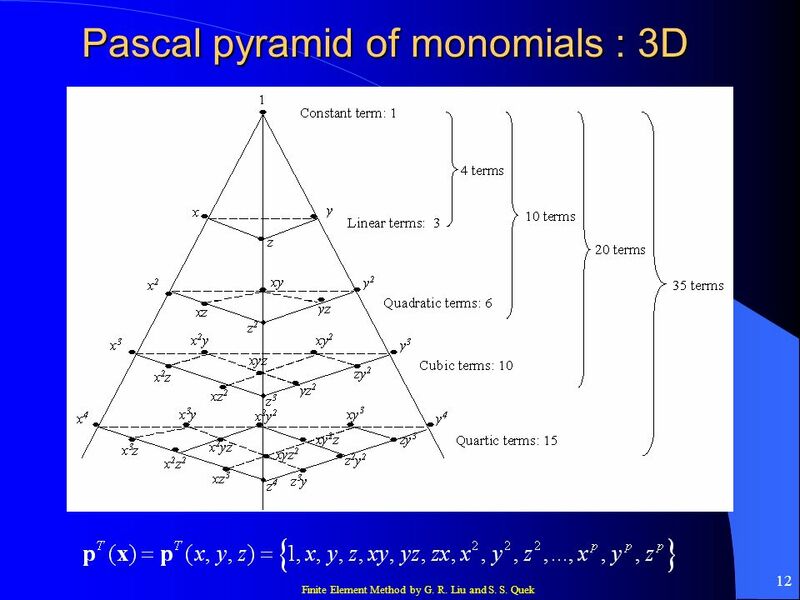 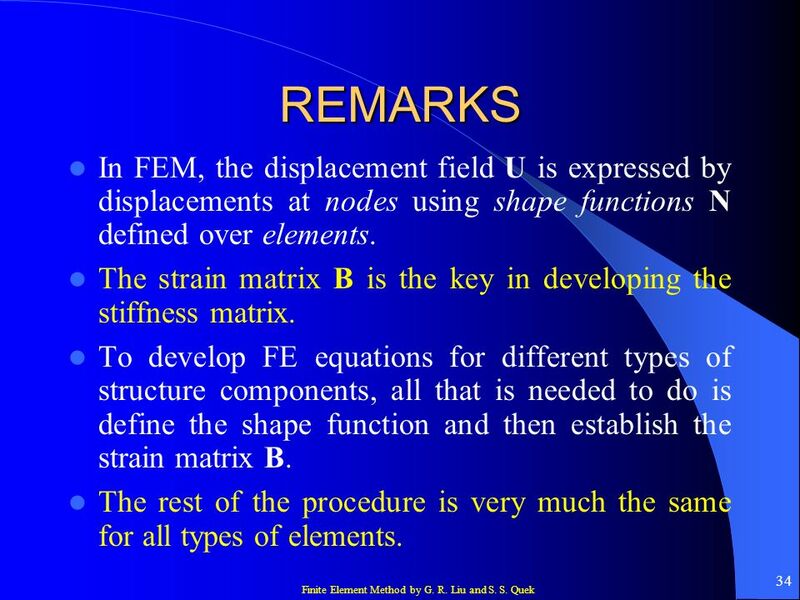 34 REMARKS In FEM, the displacement field U is expressed by displacements at nodes using shape functions N defined over elements. 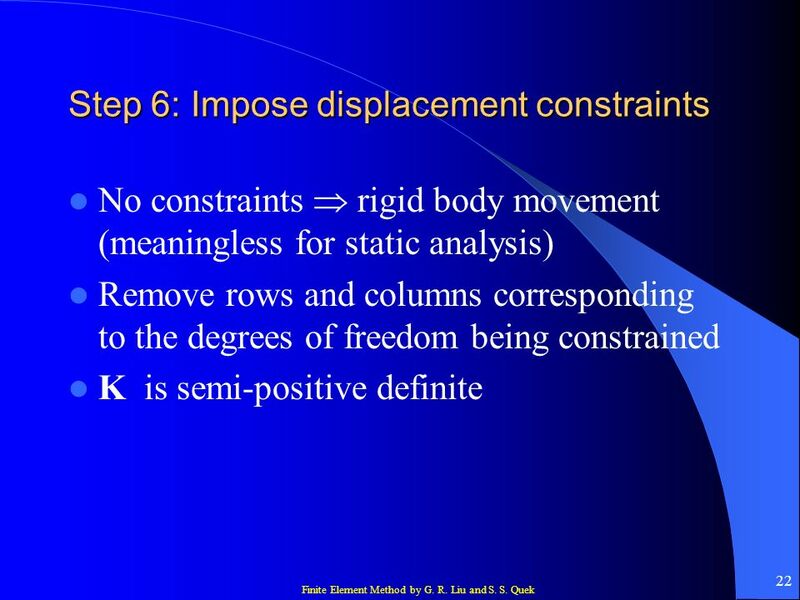 The strain matrix B is the key in developing the stiffness matrix. 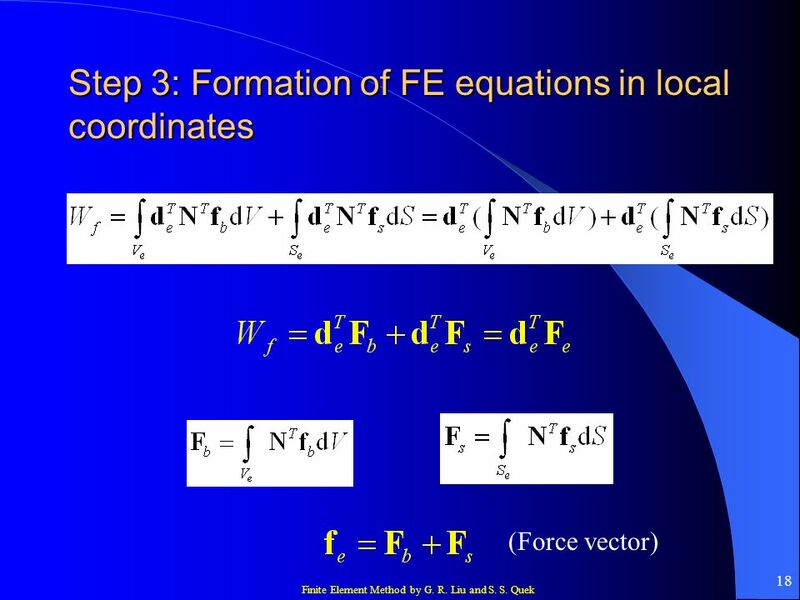 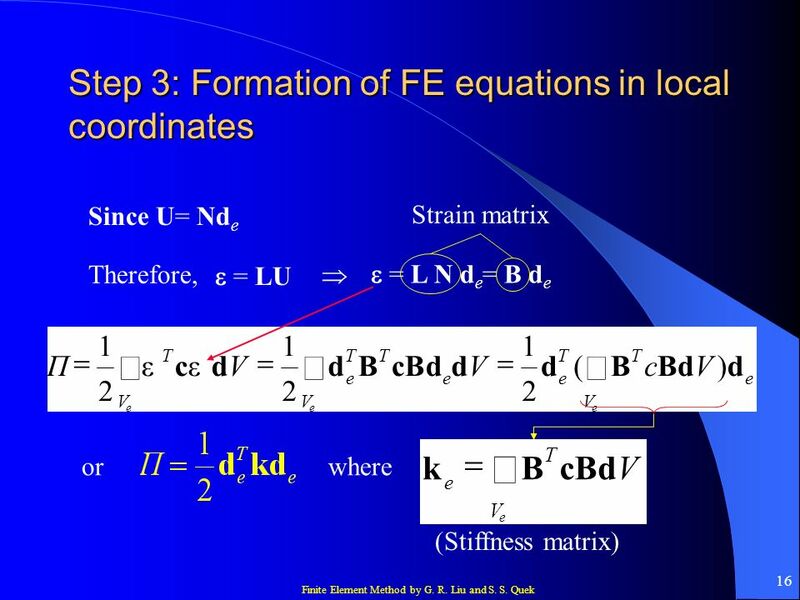 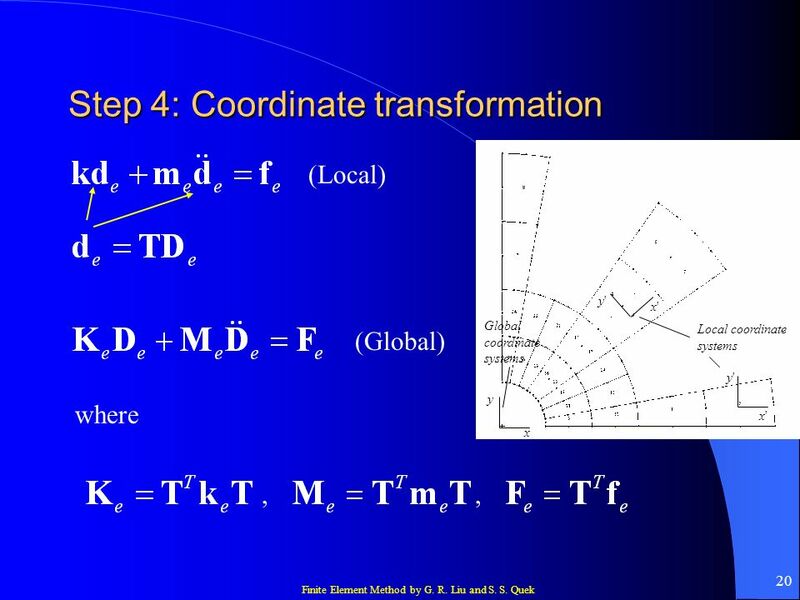 To develop FE equations for different types of structure components, all that is needed to do is define the shape function and then establish the strain matrix B. 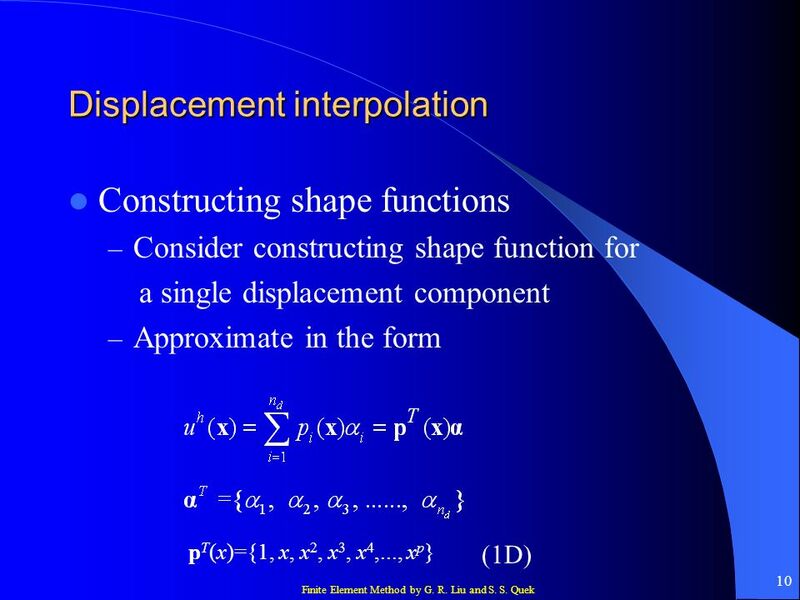 The rest of the procedure is very much the same for all types of elements. 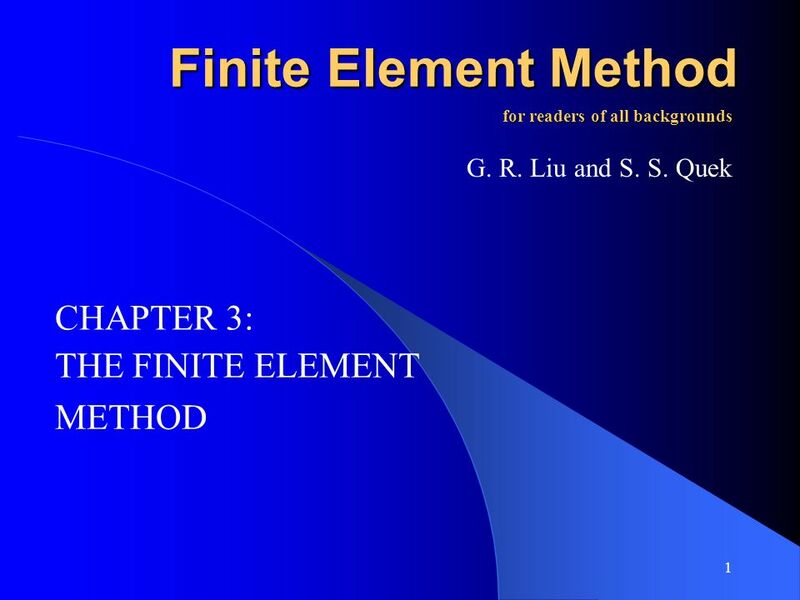 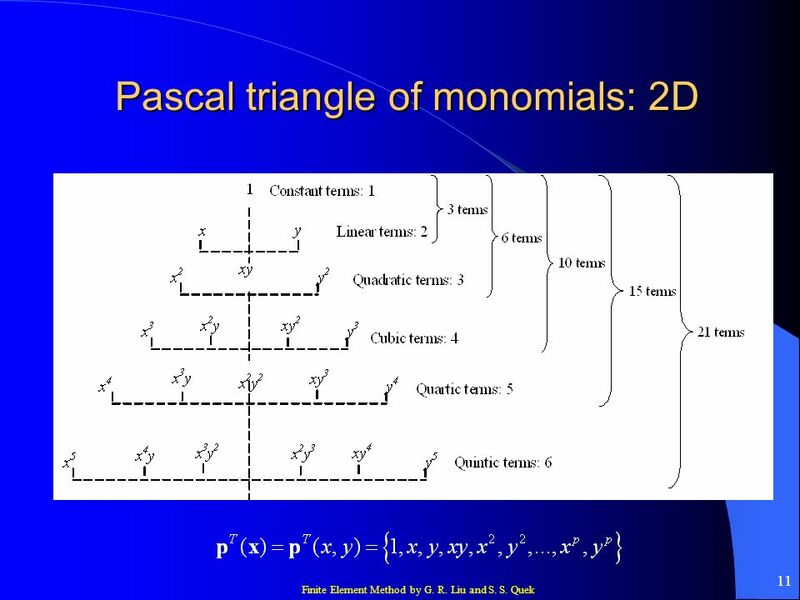 Download ppt "THE FINITE ELEMENT METHOD"